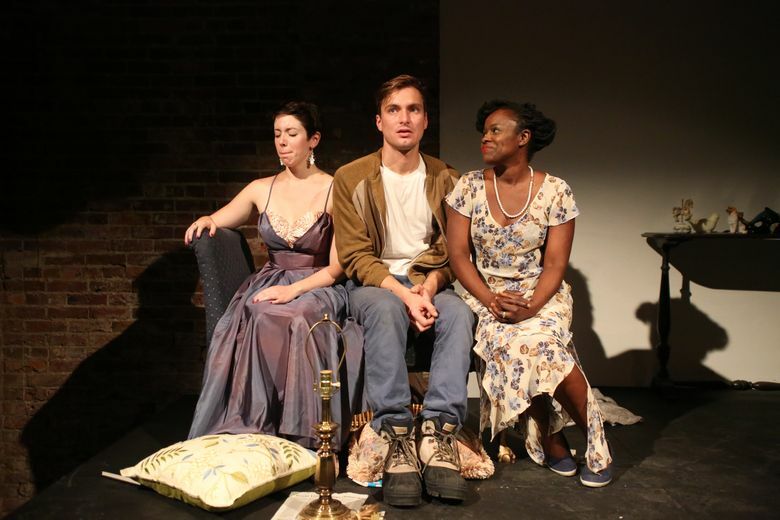 Elise LeBreton, left, Leicester Landon and Nancy Moricette in “The Glass Menagerie,” an immersive production of Tennessee Williams’ classic play by The Williams Project and Cafe Nordo. The innovative Williams Project and dinner-theater purveyor Cafe Nordo team up for a re-imagined production about the trials of Tennessee Williams’ famous Wingfield family. On a sweltering Seattle evening, a gathering of expectant diners ate supper in the home of the Wingfield family — a tenement flat occupied by fluttering, hovering mother Amanda, her shy daughter Laura and restless, cynical son Tom. Some of those tucking into pot roast and black-eyed peas, served with a Southern drawl, shared a table with the Wingfields on that sultry night. But all present soaked up the anguish and disappointment, the mordant humor and elusive dreams perfuming the room, in an unusually intimate production of “The Glass Menagerie” at Nordo’s Culinarium in Pioneer Square. It continues through Sept. 3.
by Tennessee Williams. A coproduction between The Williams Project and Cafe Nordo, through Sept. 3, Nordo’s Culinarium, 109 S. Main St., Seattle; $80, includes dinner (800-838-3006 or cafenordo.com). This atmospheric and culinary interpretation of the classic Tennessee Williams drama bears the stamp of The Williams Project, which earlier tackled a more obscure script by the playwright (“Orpheus Descending”) with similar blazing intimacy. What artistic director Ryan Purcell and his actors do is not so much reconfigure the tender, brutal tales of Williams, but invigorate and free them from domestic claustrophobia, while embracing their unabashed emotionality. Purcell’s direction also incorporates multiracial casting, immersion into the audience and other contemporary staging gestures — some revelatory in this instance, others less fruitful. Nancy Moricette’s Amanda is a Depression-era single mother whose genuine concern for her “unusual” children is undermined by desperate financial straits and the bitterness of abandonment. Honeysuckle sweet one moment, berating the next, Moricette captures the shrillness, warmth, coquettishness and panic of a Southern belle on whom the bloom of promise has long faded. (An additional irony here, underscored in just one line of dialogue, is that the actress is African-American while the offspring she “serves” are white). Amanda survives on bare-knuckle tenacity, browbeating and pressing Grant Chapman’s sullen Tom to keep the family (barely) afloat with his menial factory job. And in a last gasp of false optimism, she urges him to find a proper suitor for the emotionally and physically frail Laura (Elise LeBreton). As narrator of this semi-autobiographical “memory play,” Tom is an acerbic match for a mother he not only resents but, in this rendering, despises more than pities as he longs to break out of a dead-end job and (one easily infers) a thwarted sexuality. Chapman has a hawkeye stare and a dancer’s build and moves like a caged cat through the elongated Nordo space, where much of the action winds through and around the audience between dinner courses. He is an unnerving match for Amanda and voices Tom’s frustrations and insights with the clarity the diamond-sharp poetic dialogue thrives on. But when repeatedly Chapman speaks some of Amanda’s more cloying monologues, while Moricette lip-syncs the words, it tiresomely makes the obvious point that he’s heard it all before. The director’s hand lies most heavily on LeBreton’s Laura. Gone are the character’s often-referenced limp and the extremes of her timidity. More than retreating into her collection of glass figurines, this blunt-spoken Laura’s escape is rocking out (like a 21st-century kid) via earphones. Turning a withering wildflower into an anti-social punk is an intriguing concept, but little else here supports it. But Laura’s damage and radiance are finally revealed in a more straightforward, nuanced treatment of the magical encounter with her one and only gentleman caller (a charmingly awkward, touchingly sincere Leicester Landon), who innocently buoys and dashes Laura’s hopes with an ecstatic waltz and a single kiss. The down-home Café Nordo dinner that accompanies the play is tasty, and the meal (if not the menu) is written into the play. And The Williams Project is a company to keep tabs on, given its worthy mission to revitalize poetic American drama with some modern theatrical daring and a lot of heart.